Keeping stick insects as pets can be great fun for everyone. Some species are very easy to keep, while others pose more of a challenge to the real insect enthusiast. For everyone there is a nice species to keep, but all species require care. This page will take you through all the basics of caring for any stick insect species. 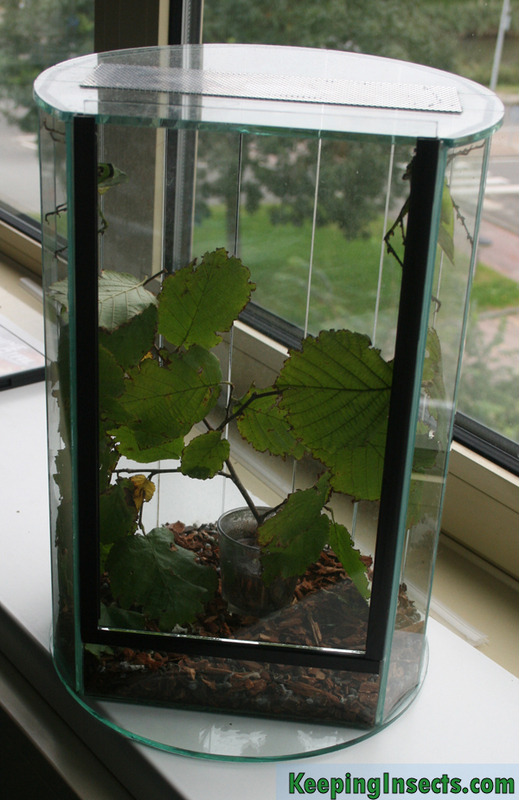 You stick insects need a terrarium, enclosure or netcage that is big enough for all of them. Which type of enclosure you could us is stated here. The cage of your stick insect should be at least 3 times the body length of the insect in height and 2 times the body length in width. If you keep more than one stick insect, you have to add some space for each one of them, preferably in width of the tank. Stick insects really need 3 times their body lenght in hight to survive, because they need this space while molting. When stick insects shed their skin, they hang upside down on their old skin. This means they require a large vertical space to molt. When molting goes wrong or the space they have is limited, the stick insect will die or be severely deformed. The enclosure of you stick insects does not need much decoration, because the leaves you will feed to the insects are also their habitat. You do need to cover the floor of the enclosure with a moisture-absorbing substrate like potting earth, small pebbles or tissue paper. The roof of the enclosure should be made of netting or mesh to ensure that the stick insects can hang from this roof when molting. Molting from the roof is much more likely to succeed than molting from branches, leaves or other things in the terrarium, especially for heavier and bigger stick insects. Every stick insect species needs a specific temperature and air humidity to survive. Which specific requirements your species of choice has, can be read in the species description. How to maintain a proper humidity and temperature, read the respective pages: Humidity and Temperature. To ensure proper humidity, you need to spray the enclosure of your stick insects every day or every week, depending on the type of housing and on the species that you keep. Stick insects eat leaves, but they do not eat all types of plants. Every species has one or more plants which they eat, while they will refuse to eat other leaves. Therefore you have to be sure to feed the correct species of plant to your stick insects, because they will starve when fed the wrong kind. To read which species of plant your insect eats, visit the species section. To see pictures of all the most commonly eaten plants, visit Food Plants. Stick insects only eat fresh leaves. To ensure the leaves you offer them stay fresh, you have to put the branches with leaves on them in a vase with water in it. Exactly like cut flowers! 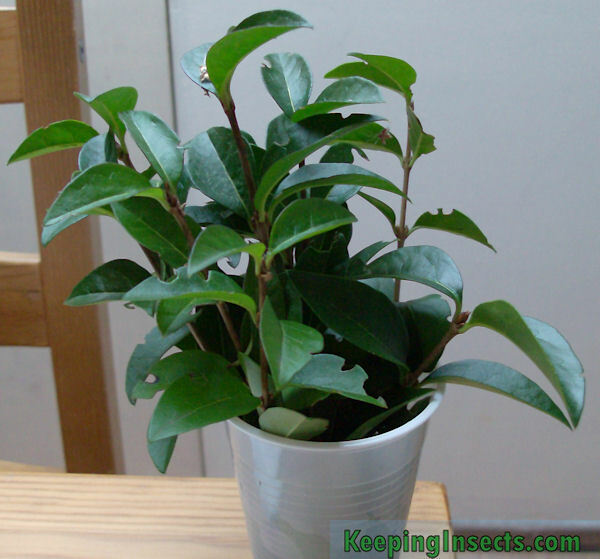 Just cut the branches with the leaves on them with a sharp scissor or knife, and place them in a cup filled with water. Make sure the cup is stable, it should not easily fall over. To make it more stable, you can fill the bottom of the cup with sand or stones. When keeping small nymphs, the nymphs should not be able to fall into the water. They will quickly drown if they fall in the water, even if there are ways to crawl out of the cup. To prevent them from drowning, but tissue paper in between the branches to block acces to the water. Also putting musquito netting over the cup and putting the branches through this netting will prevent young nymphs from drowning. To my experience, bigger nymphs and adults do not need such protection. You need to replace the food when the leaves become too dry or when the branches are completely stripped of their leaves. Stick insect should have food at all times! Do not leave them without fresh leaves. You can put the leaves that you will feed to your stick insect in a cup like this. These are privet leaves. Stick insects need regular cleaning of their terrarium, because they produce a lot of droppings. Especially when the terrarium is kept under high humidity, this will quickly become full of mold and fungi when not cleaned. Therefore I recommend to remove all substrate every week and replace this with fresh substrate. Paper tissues work fine for me as a substrate and is easy to replace. If you use pebbles or sand you can use a sieve to clean the substrate and place it back in the terrarium when you are finished. Make sure to remove all droppings and all old leaves. Also clean the cup in which the leaves are being held, to make sure that the water stays fresh.